Today, I have reason to celebrate: Exactly one year ago, I published my first blog post as part of the Learning Scientists. So funny that my 1-year anniversary coincides with me writing a blog post today. In my very first blog post a year ago, I gave an overview on the effects of Listening to Music while Studying. Today, I thought it would be nice to revisit the topic of music, but in a different way: A recent study (1) investigated whether learning to play the piano benefits from spaced practice and, to my surprise, they found this not to be the case. I decided that I needed to take a closer look at the study before drawing premature conclusions. Wiseheart, D’Souza, and Chae (1) invited participants, who had never received formal piano lessons before, to the laboratory and taught them to play musical sequences using two tasks. The first task was an unknown 17-note piece that is usually used as finger exercise to improve strength, agility, speed, and precision. In the figure below you can see the note sequence that was used. Participants were asked to practice this 17-note sequence and play it to a metronome that was set to 66 beats per minute. The second task involved memorization of musical sequences of well-known songs, e.g., Row Row Row The Boat, Old Mac Donald and so on. For this task, instead of using numbers to label the notes, they used note letters, i.e. C, D, E, F, G, on sheet music. During song learning, participants first observed the experimenter play the songs and then they practiced the songs using the sheet music. For the follow-up tests, the sheet music was removed and they had to play the songs by heart. What did they find? 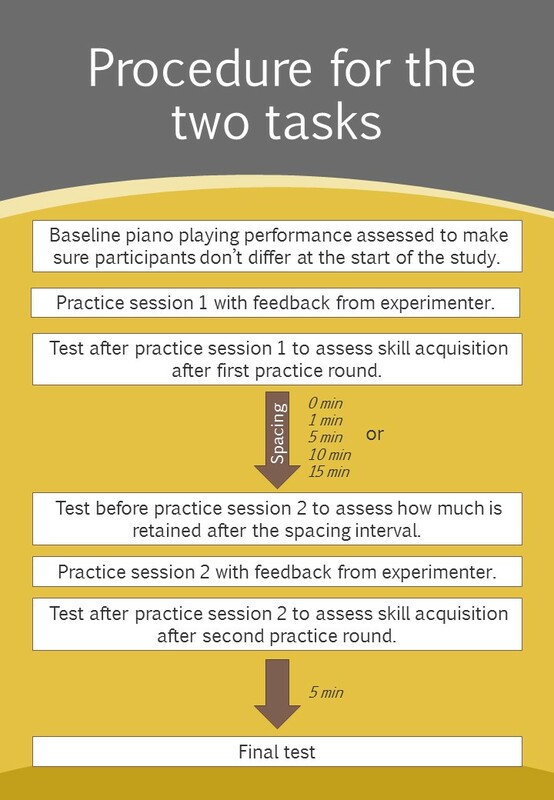 They found that spaced practice did not have an effect on any of the piano playing performance variables: Accuracy, latency, and amplitude did not improve in the condition where participants took a break between the two practice-test blocks compared to the condition where no break was scheduled. Plus, the different spacing intervals, i.e. 1 to 15min, did not make any difference in performance later on. a) The study by Wiseheart et al. (1) used very short spacing intervals only and in educational music learning settings you will usually use much longer breaks between practicing and re-practicing the same piece. It is possible that spacing will have a stronger effect when longer intervals are used. Wiseheart et al. report that there was virtually no forgetting between the first practice-test block and the second one. This basically means that from a forgetting perspective, all spacing conditions were the same. Thus, if we assume that forgetting and reconstructive processes during the second practice session are key, we should not be surprised that no spacing effect occurred in this study. Research into music instrument learning and spaced practice is still new – relatively to verbal learning and spacing studies – and more research is needed before we can make strong recommendations. The presented study is a good first step and definitely stimulates further investigations. (1) Wiseheart, M., D’Souza, A. A., & Chae, J. (2017). Lack of spacing effects during piano learning. PLoS ONE, 12: e0182986.